Giving your beloved a locket with a picture of you inside is a pretty last-century thing to do. 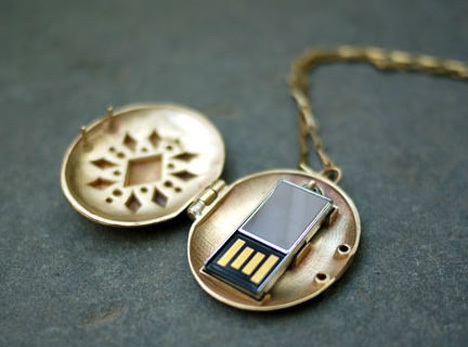 The USB Locket from Emily Rothschild stores memories in a much more geek-friendly way. When you open up the classy brass locket, a 2GB flash drive is waiting inside. The USB locket stores pictures, sure, but a whole lot more than a standard locket. And with 2GB you’ll also have a lot of room for love songs, poems and whatever other mushy stuff you can think of. The locket is available in mini or standard size with corresponding flash drive. And if you aren’t into mushy stuff, you can always use it to hide your innermost secrets or pretend you’re a spy. See more in Home & Personal or under Gadgets. September, 2011.